This is a perfect craft to keep for yourself or give to a friend as a gift. This Christmas ornament speaks for itself. It's glittery and beautiful. Acrylic paints and styrofoam balls put this ornament together. Balls, one each size: 3", 2", 1-1/2"
White ribbon: curling, 1/4" x 1/2 yd. ; wire-edged sheer, 1" x 1/3 yd. Wax serrated knife with candle stub or paraffin; cut 1/4" from top and bottom of 2" ball. 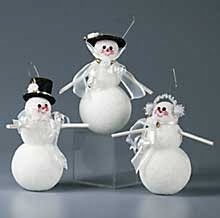 Tightly twist balls together to form snowman; use glue gun to secure. Use craft snips to cut dowel in half for arms; paint pearl. While still wet, sprinkle with white glitter. Push cut ends into scrap piece of foam to dry. Insert skewer into bottom of snowman. Holding skewer, spread craft glue evenly over entire snowman. Sprinkle surface with white glitter; use fingers to gently press glitter into glue. Stick skewer into scrap piece of foam to let glue dry. Use glue gun to glue arms into body as shown. Glue and gently press beads into foam for eyes, cheeks, and buttons. Use craft snips to cut 1" from pointed end of skewer for nose. Paint orange; glue to face. Use liner brush to paint tiny rose mouth. Trace patterns onto black craft foam; cut out with craft knife. For snowman, overlap short hat crown edges 1/4"; use glue gun to secure. Use craft glue to glue top inside crown and crown to brim; let dry. Apply craft glue to entire hat and sprinkle with black glitter; let dry. Glue hat to head. Glue short length of curling ribbon around hat for band; glue ribbon rose to band. Tie sheer ribbon around neck. Tie remaining curling ribbon around neck; use scissors blade to curl ends. For snowlady, make a cut from edge of hat crown to center. Overlap edges and bend crown into shallow cone; use hot glue to secure. Use craft glue to glue crown to brim. Apply craft glue to entire hat and sprinkle with black glitter; let dry. Glue bonnet to head. Center sheer ribbon over top of bonnet; tie under chin. Spot glue knot to chin to secure. Tie curling ribbon around neck; use scissors blade to curl ends. Glue ribbon roses to hat brim and ribbon knot. For snowbaby, bend chenille stem into a "U"; glue ends to sides of head. Glue pom poms over chenille stem ends. Tie sheer ribbon around neck. Tie curling ribbon around neck; use scissors blade to curl ends. Cut 3" length from wire for hanger. Bend wire into hook; glue into top of head.